A lady in red is elegantly bold, knows the power within her, and is fearless in her ambitions. For today's outfit post, I tried my best to channel some of that lady boss confidence in this retro-inspired look. 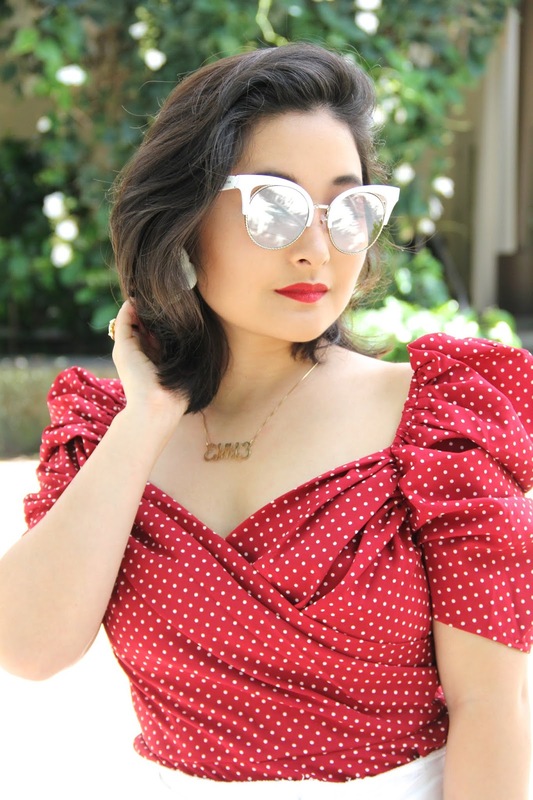 As someone who loves vintage pieces, I often think about retro prints and silhouettes even when shopping at trendy stores like Shein, Zara and Forever 21. 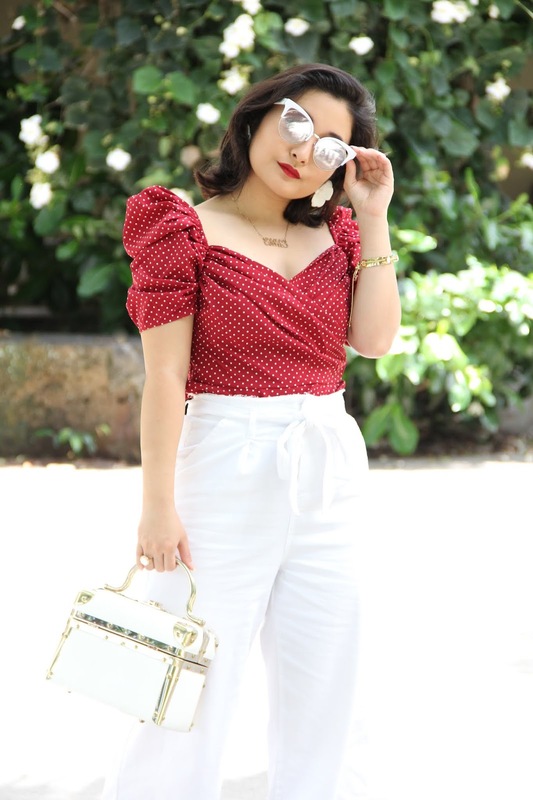 As I browsed through the items on Shein's website, I fell in love with this red polka dot puff sleeve peplum blouse. Any blouse that has exaggerated sleeves instantly captures my attention. Shein was incredibly kind to send me this piece to style and share it with you all here on Elizabeth, Marie, and Me. 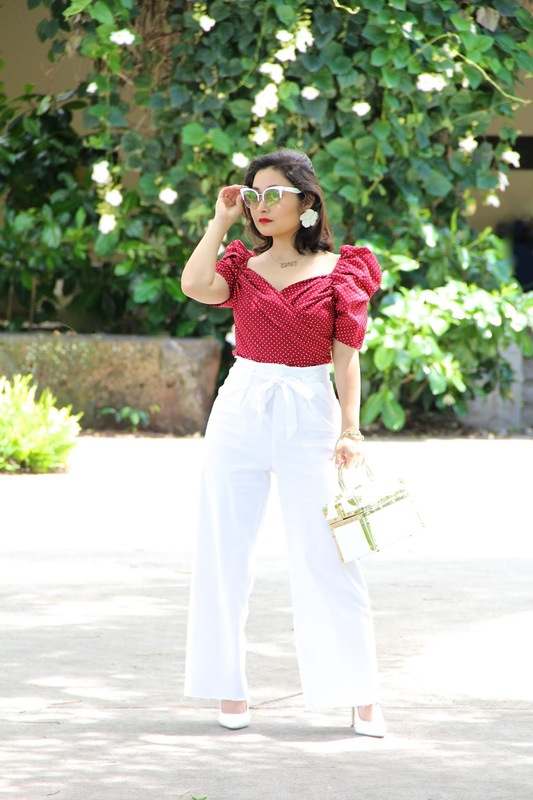 To accompany the crimson top, I chose a pair of white high-waisted wide-leg pants to cinch at the waist with a matching bow. I also trickled the vintage vibes into my accessory choices to create a cohesive look. 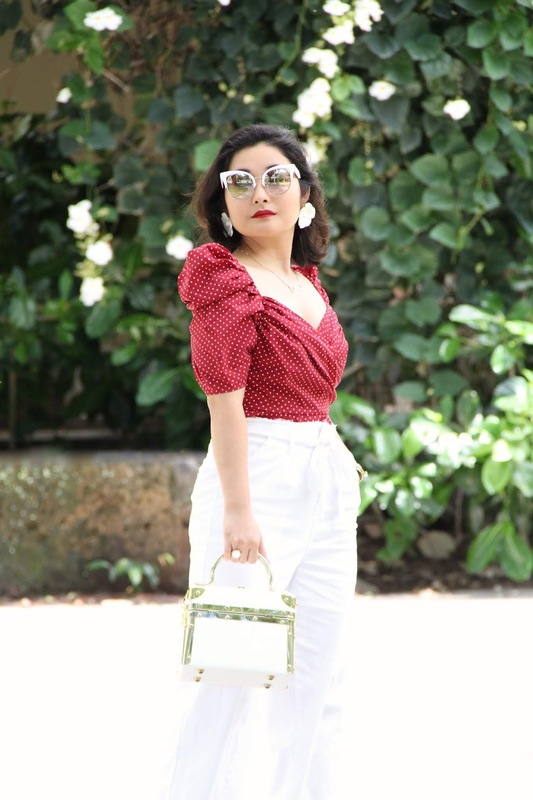 Could you tell that the purse in this outfit post is not a clutch, but actually a vintage makeup case? A box clutch has a classic silhouette that never goes out of style, so I decided to carry it out and proud as a purse. And I can't forget the white sunglasses! If cat-eye sunnies don't scream retro, I don't know what does. That pretty much sums up this "Lady in Red" look! What do you think? Did I successfully channel lady boss vibes? Be sure to let me know in the comments below. Until my next outfit post, I am sending you lots of love from my heart to yours! Thank you so much, Etan!